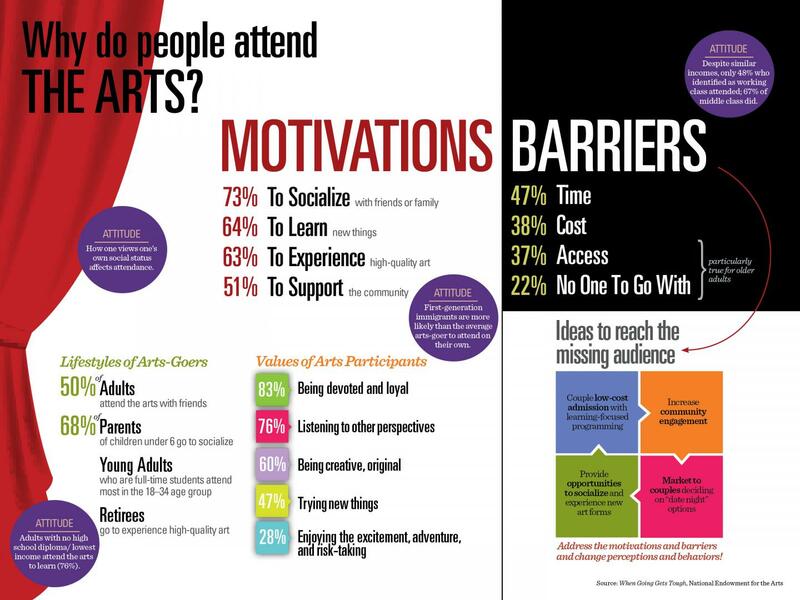 In 2012, the National Endowment for the Arts partnered with NORC's General Social Survey to ask why people attend arts events. This new report looks beyond demographics to discover the attitudes, motivations, and barriers for attending the arts at different life stages. Nearly 60 percent of people with children under age six said lack of time was the greatest single barrier to attendance. This finding could inspire arts providers to develop more family‐friendly program options. Some noted that the location was too difficult to get to. This was especially a problem for retirees, older adults, and adults with physical disabilities. If we're quantifying the value of what we often term "access to the arts," it's about 11 million lost audience members or exhibit‐goers. Twenty‐two percent of those who wanted to attend but chose not to said a barrier was not having someone to go with. Top reasons Americans attend the arts (performances and exhibits) include socializing with friends or family members (73 percent); learning new things (64 percent); and supporting the community (51 percent). Despite similar household incomes and education, people who call themselves middle‐class were more likely to attend the arts than those who identified themselves as working class. Thwarted interest, rather than lack of interest, may be the cause for lower attendance rates among some audiences. Life stages — pursuing higher education, marriage, child‐rearing, and retirement — are often more predictive than age alone, as a factor in attending the arts. For example, parents with young children under age six more often cited socializing with family or friends, learning new things and celebrating cultural heritage when they attended performances accompanied by their children. Telegraph: Is art best enjoyed in company?